Effetti: Ian Wingrove, Robert R. Shepherd (Robert Shepherd), Apogee Productions Inc.
Tratto da: Racconto di Kevin McClory, Jack Whittingham e Ian Fleming. 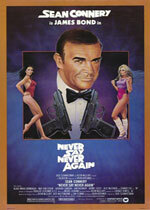 - REMAKE DI AGENTE 007, THUNDERBALL - OPERAZIONE TUONO DIRETTO DA TERENCE YOUNG NEL 1965. - E' L'ULTIMA APPARIZIONE DI SEAN CONNERY NEI PANNI DEL LEGGENDARIO AGENTE 007. - IL FILM E' STATO CAMPIONE DI INCASSI IN GRAN BRETAGNA NEL 1984.